Server storage rentals are optimal if your business needs an extra file storage and data storage unit for your organization, we provide SAN/NAS/DAS at an affordable price. It’s usually difficult to get enough servers space to place servers, to solve these problems by taking storage servers for rent would be the best option for any business need. Store your backups or large volumes of business data on a reliable IBM, DELL, HP, CISCO, QNAP, BUFFALO, SYNOLOGY storage server with guaranteed availability. Many options for business data storage systems like DAS, NAS and SANs storage server are available for rental, considering your business requirement you need to choose the right one. Choose storage depending on capacity, scalability, reliability, performance of your business, and also check with backup and recovery options from RAID 0, raid 5, raid 1, raid 50 and raid10. Limiting budget and finally dedicated staff to maintain. We provide all storage types to suit any type work environment and workloads. High-end performance on DELL, HP, Cisco, IBM, QNAP storage servers is achieved with additional SAS, SATA and SSD storage drives power to them. 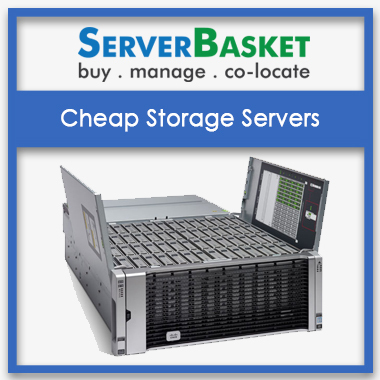 Storage servers on rent offer tons of benefits including Optimized performance, unified storage, consolidate multiple protocols, including Fiber Channel, ISCS and NAS into a single integrated system for affordable cost and management efficiencies. Low to high-end storage servers are available for rent, customer needs to choose the exact one to suit their business infrastructure. DAS is low cost and low maintenance solution offering greater flexibility in data sharing, specially designed for small business and startups. NAS is perfect for SMBs and growing organizations that need minimal maintenance and reliability. SAS is a high-performance storage system to transfer block-level data at data centers, enterprises or mission-critical applications. Once the customer gets to know about factors essential for business operations, they can find the perfect storage option to fit their needs and place an order. We are ready to deliver immediately any storage server for rent depending on requirement anywhere across any location and to any city in India like Delhi, Chennai, Hyderabad, Bangalore, Chandigarh, Pune, Lucknow, Visakhapatnam, etc, without any payment, absolutely at free of cost. Our technical support team will be there for an entire rental period, especially for the installation of equipment by a certified and trusted professional engineer. Total customer support 24 X 7 is offered throughout the rental period of a server to resolve all your issues and set things straight. You can reach us anytime on the phone, email or chat.